We believe that Corporate Responsibility is a part of who we are and an integral part of how we operate. We are committed to ensuring a future where we can continue to help people, families and communities. We want to do the right thing for the people that matter most; our customers, agency partners, employees and the communities where we live and work. At Legal & General America we believe that to be successful we must actively contribute to our local communities and take measures to care for human and natural resources. Installation of workstations made of 53% recycled materials which at the end of their useful life will be 78% recyclable! We work diligently to manage our environmental impact by controlling waste, lowering consumption of water and energy, and overall continuous improvements to our operating facilities. Our efforts have been recognized and rewarded with the EPA’s Energy Star Certification award for the past several years (2013-2018). This award indicates that our building uses 35% less energy and generates 35% fewer greenhouse emissions than similar buildings across the nation. Legal General America makes recycling a priority and has a recycling plan in place for glass and plastic bottles, cardboard and all paper. In 2018 we recycled over 81,900 pounds of paper, the equivalent of 693 trees. After being shredded at our facility, all shredded materials are transported to a paper mill for an additional 2 step shredding/pulping process after which the waste materials are made into renewable products. At Legal & General America, we make contributions of both time and money and our employees play an active role in supporting our social responsibilities. Giving back will always be a vital cornerstone of our business. Each year, Legal & General America holds a Charitable Giving Campaign through America’s Charities. During the campaign, employees have the opportunity to participate in fundraising events at work that encourage teamwork and create excitement about giving. Employees are also encouraged to pledge donations by payroll deduction to the charities of their choice and our company matches every dollar. The campaign is an annual success story for a corporation like ours. As is customary, our employees are able to pledge to their non-profit organization of choice and we annually select charities to feature. The featured charities selected in 2018 were Second Chances Garage and America’s VetDogs. Our employees worked together to raise money for our feature charities through fundraisers and employee pledges. With a little more than 600 employees, we raised $476,716.33 in our 2018 campaign. With a matching donation from Legal & General America, our total raised was $952,845.36 which will aid hundreds of different charities. Of the total donations, approximately $70,000 was raised for our feature charities. For additional details on our 2018 campaign, please view our news article. Each year, Sir John Kingman, Chairman, hosts the Community Awards to recognize the amazing achievements of our employees. Employees are nominated by their peers for their volunteer work in the community. Their stories are an inspiration for others. Nominees include employees from all Legal & General Group companies. The nominees and their stories are available for voting by both employees and the general public. When the nomination process has closed, all nominees are invited to join the chairman and the group board for a celebratory lunch and awards ceremony. Legal & General America was one of the initial charter corporate partners of the Charitable Foundation established by the National Association of Independent Life Brokerage Agencies (NAILBA). The mission of the NAILBA Charitable Foundation is to encourage volunteerism among NAILBA members and provide grants to worthy charitable organizations that serve to enhance the quality of life for those less fortunate, placing a special emphasis on children. 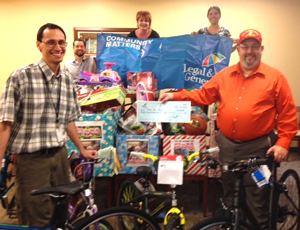 Legal & General America’s employees have supported the community in many ways. We encourage our staff to volunteer and raise money through activities including sponsored walks, dress down days, and bake sales to name a few. There have been many good causes close to the hearts of our employees that we have supported. Some of our community partnerships over the last 12 months have included Frederick Memorial Hospital, Marine Toys for Tots, Animal Welfare League of Frederick, Relay for Life (American Cancer Society), A Wider Circle, March of Dimes and Long Island Cares. We match employee contributions to approved charitable organizations or institutions of higher education up to $1,000 per year. Besides matching employee charitable donations, we also provide charitable funding to select organizations such as the local fire department. Many employees volunteer on their own time for community initiatives, local libraries or schools. We have a volunteer program that provides employees two paid days off per year for approved charitable work.